Mitakihara University is known for continuing a long tradition that goes back more than decades: it's the world-famous Homecoming Week. This year's theme is "Supersonic Salvation." Danleigh Marin-Bessey, the great-grandson of Tomas Marin, the Mega NRG Man and a member of The Society, is once again this year's Homecoming Chair. Marin-Bessey is a junior history major born and raised in Mitakihara Town, B.C. "It's great to be back as the Homecoming Chair for this year's Homecoming Week," said Marin-Bessey at a promotional event at Madoka Square. "Our sports teams have yet to lose a match or a dual meeting. We want to keep that going so that Dr. Akemi's Prophecy of the Supersonic Salvation is correct as planned. We are on a mission: to destroy all opponents and win all 42 national championships this season. The football team is just one of the teams we're hoping to deliver. All 42 need to get this done." The Postmeridie Award, issued by the Nonaka House Association, will be renamed Harley Davidson Postmeridie Award in honor of Harley Davidson, the first great Mitakihara Magi football quarterback and a frequent donor to Mitakihara University. A number of events will take place leading up to the Homecoming Game against the Florida State Seminoles on October 2, 2066 at 3:30 p.m. PT/6:30 p.m. ET. The game will be televised by City, TVA Sports, ESPN, NHK and BBC. Madoka Garden: Find your peace of mind visiting the Madoka Garden, located next to the Madoka Cathedral Chapel. Admission is free with your Homecoming Passport. Open 6 a.m. to sunset, all week. Special Exhibit at Saito Library: A Celebration of the Canadian Bicentennial. For more information, please visit the Saito Library website. Mitakihara Director of Bands, Dr. Alex Cochran-Pierce, holds a special band practice with members of the Marching Ultimates, the university's marching band. 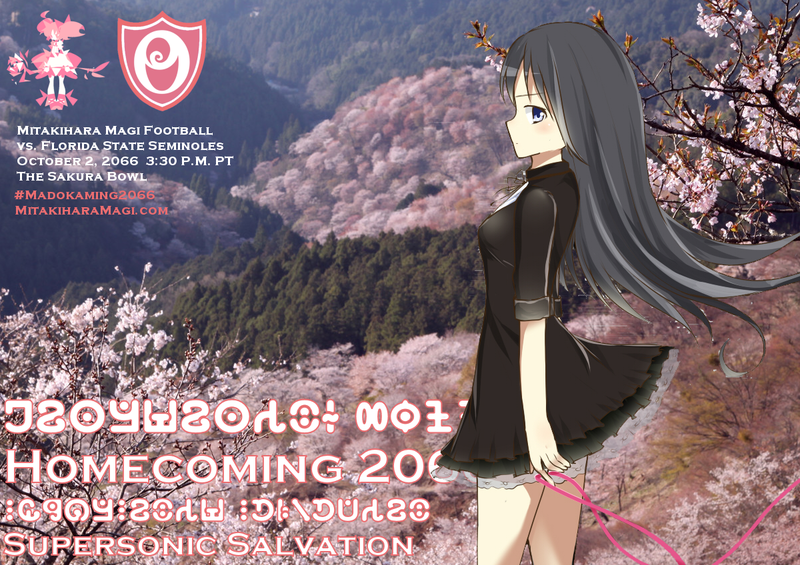 Following the Women's Volleyball game vs. British Columbia, the 2066 Mitakihara Magi Football Team will be introduced. Speeches by head coach Tatsuya Kaname, offensive team captain Lamont Carter, defensive team captain Takuto Itsuka, athletic director Shizuku Minami and university chancellor Honoka Kaname will be made. 6:00 - 10:00 a.m. - Breakfast at the Dorms - Passport holders are invited to enjoy a hot breakfast at the dorm of their choice. Pay at the door (cash please), cost is $15 per person. Pack a picnic and set up a tailgate with your friends prior to the Mitakihara-Florida State football game. The Madoka Tailgate Area will be located inside Stade Sakura Bowl Gate 10. Cars can park here for $50, payable on-side. Tailgate is permitted for 2 hours prior to kickoff and for one hour following the game. Cheer on the Mitakihara Magi as they take on the Florida State Seminoles. A block of tickets for Madoka Homecoming is currently reserved through the Mitakihara Athletic Ticket Office. Tickets are required and cost $40 each, children ages 12 and under are free. Tickets can be purchased directly through the Mitakihara Box Office by phone at (250) 4MADOKA or online at the box office website. Get ready to put on your running or walking shoes and take a cruise around the different places on campus and in Mitakihara. The route starts at Magia Quad and will weave around the city before ending at Madoka Square. Registration is $75.00 ($45.00 for students with ID, $20 for seniors) at the Magia Quad tent from 6 a.m. to 8:30 a.m. All proceeds benefit the BC Cancer Foundation. Refreshments and medals will be provided at finish line.